Now with three monthly subscription packages and pricing levels to choose from: Advanced, Intermediate, or Basic, your organization has the flexibility to pay for only the features it needs. This innovative System provides a reliable way to easily double-check laser safety calculations. It is based on the ANSI Z136.1 American National Standard for Safe Use of Lasers and will perform repeated calculations of maximum permissible exposure (MPE), optical density (OD), nominal ocular hazard distance (NOHD), nominal hazard zone (NHZ), and laser hazard classification. Plus, you can easily upgrade or downgrade to any subscription level at any time — making it a flexible and scalable solution for dynamic organizations. Specially designed for users with minimal experience, the Basic package provides the essential and fundamental laser hazard calculations in an easy and simple format. The user-friendly navigation makes calculating eye hazards, wavelength, pulse width and other important calculations easier for novice users. Medical facilities, small colleges, education institutions and other organizations with basic laser equipment and applications would benefit greatly from this affordable and practical laser safety hazard software package. 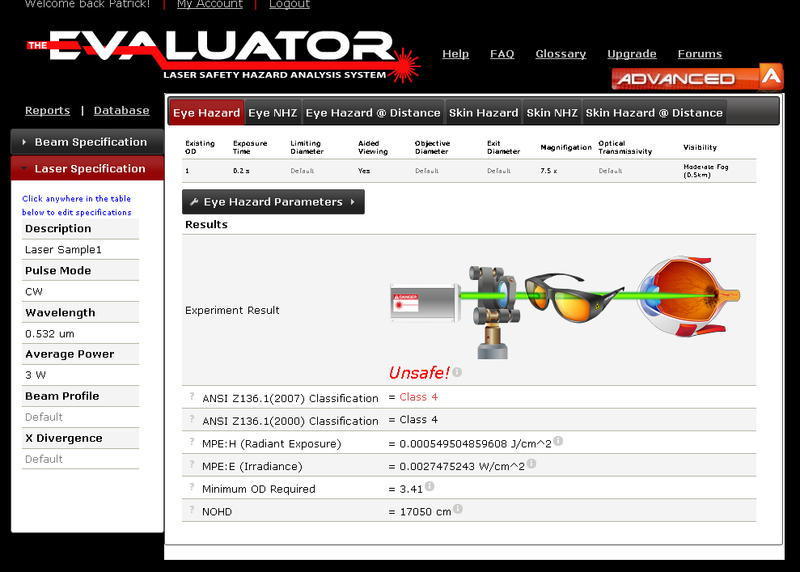 Ready for a simple solution to laser safety hazard calculations? Click here for an interactive demonstration of The Evaluator. Our most popular subscription level, the single-user Intermediate package provides the best solution for industrial applications and organizations where laser safety calculations are needed for skin as well as eye hazards. We recommend the Intermediate level for industrial manufacturing facilities, job shops, auto industry and organizations that process metals. When upgrading to Intermediate from the Basic package, the additional features include elliptical, rectangular, and tophat profiles, focused beams, classification, exposure time, MPE skin, reflections, laser barriers and reports. Ready for an innovative and easy-to-use solution for laser hazard calculations? Perfect for the professional LSO, the single-user Advanced subscription level provides more comprehensive and detailed features for performing sophisticated laser calculations. It is a must-have for experienced and highly skilled LSOs working in research facilities, government, military, and advanced laboratories. Professional-level LSOs will appreciate the more advanced features in this package including source size, laser database, range, aided viewing, atmospheric attenuation, limiting aperture, OD at Range and graphs. 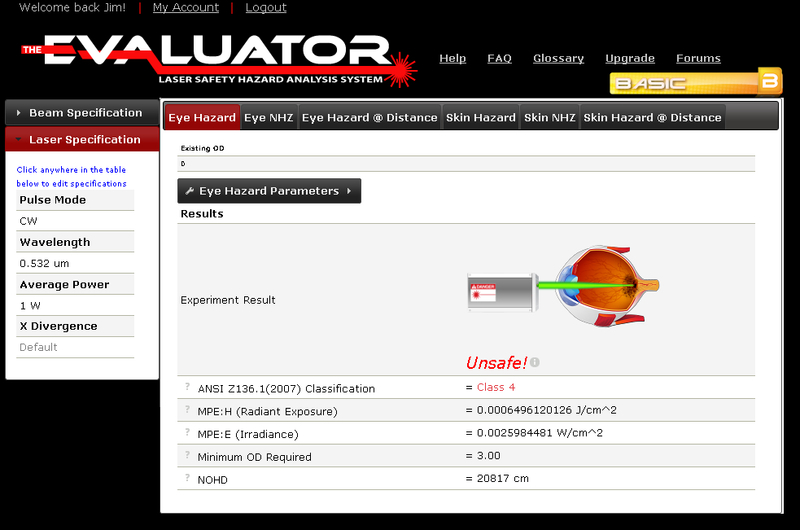 Ready for an advanced, yet easy-to-use solution for sophisticated laser hazard calculations? Unlike the web-based system, the Desktop Evaluator is delivered on a USB drive, from which users can download the program to their computer. As a software program stored on the computer, the Desktop Evaluator eliminates the need for internet access. 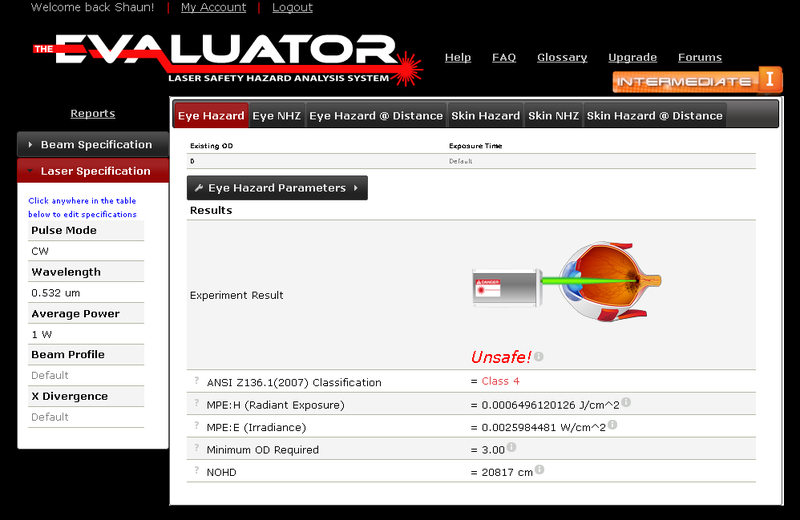 Similar to the web-based version, the Desktop Evaluator performs a number of repeated calculations based on the ANSI Z136.1-2014 American National Standard for Safe Use of Lasers, including: maximum permissible exposure (MPE), optical density (OD), nominal ocular hazard distance (NOHD), nominal hazard zone (NHZ) and laser hazard classification. Both versions of the Evaluator offer users an easy and seamless experience, assisting LSOs of all skill levels complete necessary safety calculations in the field. For instance, both versions allow effortless switching of laser settings between CW, Single Pulse, or repetitively pulsed lasers, in addition to the adjusting of the beam profile (circular, elliptical or rectangular). However, now companies can choose the format that best meets their specific needs. Compatible with Windows 7, 8 or 10 PDF viewer, the easily downloadable program – which most closely resembles the web-based version’s advanced subscription level – lives on your computer, offering constant, uninterrupted access. This is a single user version. Installation key will expire 90 days from day of purchase.